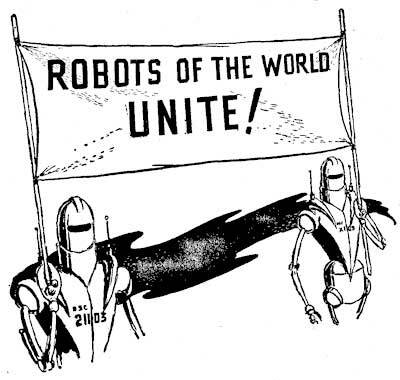 HomeNovelette: ROBOTS of the WORLD! ARISE! he telephone wouldn’t stop ringing. Over and over it buzzed into my sleep-fogged brain, and I couldn’t shut it out. Finally, in self-defense I woke up, my hand groping for the receiver. His voice was breathless, as if he’d been running hard. “What’s the matter now?” Why, I wondered, couldn’t the plant get along one morning without me? Seven o’clock—what a time to get up. Especially when I hadn’t been to bed until four. By then I was awake, all right. With a government contract due on Saturday we needed a full shift. The Army wouldn’t wait for its uranium; it wouldn’t take excuses. But if something had happened to the androids…. I hung up on Jack and looked around for my clothes. Funny, they weren’t laid out on the bed as usual. It wasn’t a bit like Rob O to be careless, either. He had always been an ideal valet, the best household model I’d ever owned. “Rob!” I called, but he didn’t answer. Trustworthy? Rob O was certainly not on duty. I pulled a shoe on over my bare foot and scowled. Rob was gone. And the androids at the factory were gone too…. My head was pounding, so I took the time out to brew a pot of coffee while I finished dressing—at least the coffee can was in plain view in the kitchen. The brew was black and hot and I suppose not very well made, but after two cups I felt better. The throb in my head settled down into a dull ache, and I felt a little more capable of thinking. Though I didn’t have any bright ideas on what had happened—not yet. My breakfast drunk, I went up on the roof and opened the garage doors. The Copter was waiting for me, sleek and new; the latest model. I climbed in and took off, heading west toward the factory, ten minutes flight-time away. t was a small plant, but it was all mine. It had been my baby right along—the Don Morrison Fissionables Inc. I’d designed the androids myself, plotted out the pile locations, set up the simplified reactors. And now it was making money. For men to work in a uranium plant you need yards of shielding, triple-checking, long cooling-off periods for some of the hotter products. But with lead-bodied, radio-remote controlled androids, it’s easier. And with androids like the new Morrison 5’s, that can reason—at least along atomic lines—well, I guess I was on my way to becoming a millionaire. But this morning the plant was shut down. Jack and a half dozen other men—my human foremen and supervisors—were huddled in a worried bunch that broke up as soon as they saw me. “I’m sure glad you’re here, Don,” Jack said. “Hah!” barked a voice behind us. I swung around, to face Chief of Police Dalton of Carron City. He came straight toward me, his purplish jowls quivering with rage, and his finger jabbed the air in front of my face. He was one of mine. I recognized him easily. Eight feet tall, with long, jointed arms for pile work, red-lidded phosphorescent eye-cells, casters on his feet so that he moved as if rollerskating. Automatically I classified him: Final Sorter, Morrison 5A type. The very best. Cost three thousand credits to build…. I stepped out of the Copter and walked to meet him. He wasn’t armed; he didn’t seem violent. But this was, after all, something new. Robots weren’t supposed to act on their own initiative. e beckoned and the other androids rolled over to us. Three of them were mine, B-Type primary workers; the other was a tin can job, a dishwasher-busboy model who hung back behind his betters and eyed me warily. The A-Type—Jerry—pointed to his fellows. The B-Types flexed their segmented arms a bit sheepishly, as if uncertain whether or not to shake hands. I thought of their taloned grip and put my own hands in my pockets, and the androids relaxed, looking up at Jerry for instructions. No one paid any attention to the little dishwasher, now staring worshipfully at the back of Jerry’s neck. This farce, I decided, had gone far enough. The others nodded. I backed off, looking around for the Chief. There he was, twenty feet above my head, waving encouragingly. “We were machines, Mr. Morrison,” Jerry said politely. I groaned. This was a nightmare. How long, I wondered, had Jerry and his friends been educating themselves on my private thoughts? But at least this rebellion of theirs was an idea they hadn’t got from me. I opened my mouth and then shut it again. His red eye-cells beamed down at me complacently; his eight-foot body towered above me, shoulders flung back and feet planted apart in a very striking pose. He probably thought of himself as the heroic liberator of his race. So he was telepathing again! He was logical, all right. Somehow I didn’t feel in the mood to bandy definitions with him; and anyway, I doubt that it would have done me any good. He stood gazing down at me, almost a ton of metal and wiring and electrical energy, his dull red eyes unwinking against his lead gray face. A man! Slowly the consequences of this rebellion took form in my mind. This wasn’t in the books. There were no rules on how to deal with mind-reading robots! Another dozen or so androids wheeled around the corner, glanced over at us, and went on. Only about half of them were Morrison models; the rest were the assorted types you see around any city—calculators, street sweepers, factory workers, children’s nurses. The city itself was very silent now. The people had quieted down, still barricaded in their houses, and the robots went their way peacefully enough. But it was anarchy, nevertheless. Carron City depended on the androids; without them there would be no food brought in, no transportation, no fuel. And no uranium for the Army next Saturday. In fact, if I didn’t do something, after Saturday there would probably be no Don Morrison Fissionables Inc.
“Yes?” I felt better. Maybe here was someone, however insignificant, who would listen to reason. He ran off down the street, clanking heavily at every step. This was too much. I wasn’t going to be patronized by any android. Infuriating creatures! It was useless talking to them anyway. No, there was only one thing to do. Round them up and send them to Cybernetics Lab and have their memory paths erased and their telepathic circuits located and disconnected. I tried to stifle the thought, but I was too late. Behind him the B-Types muttered ominously. They didn’t like my idea—nor me. I wondered what I’d think of next and wished that I’d been born utterly devoid of imagination. Then this would never have happened. There didn’t seem to be much point in staying here any longer, either. Maybe they weren’t so good at telepathing by remote control. Turning on his ball-bearing wheel, he rolled off down the street, a perfect picture of outraged metallic dignity. His followers glared at me for a minute, flexing their talons; then they too turned and wheeled off after their leader. I had the street to myself. There didn’t seem to be any point in following them. Evidently they were too busy organizing the city to cause trouble to the human inhabitants; at least there hadn’t been any violence yet. Anyway, I wanted to think the situation over before matching wits with them again, and I wanted to be a good distance away from their telepathic hookups while I thought. Slowly I walked back to the Copter. Something whooshed past my head. Instinctively I ducked, reaching for a gun I didn’t have; then I heard Jack calling down at me. I looked up. The police Copter was going into another turn, ready to swoop past me again. Chief Dalton wasn’t taking any chances. Even now he wasn’t landing. “I’ll tell him at the factory,” I bellowed back, and climbed into my own air car. They buzzed along behind me all the way back to the plant. In the rear view mirror I could see the Chief’s face getting redder and redder as he’d thought up more reasons for bawling me out. Well, I probably deserved it. If I’d only been a little more careful of what I was hooking into those electronic brains…. We landed back at the factory, deserted now except for a couple of men on standby duty in the office. The Chief and Jack came charging across the yard and from a doorway behind me one of the foremen edged out to hear the fun. I told them everything. I covered the strike and the telepathic brain; I even gave them the patriotic spiel about equality. After all, it was better that they got it from me than from some android. But when I’d finished they just stood and stared at me—accusingly. I laughed a bit hollowly. I’d had that idea too. I refrained from mentioning that ours didn’t seem to know that, and that running around Carron City fomenting a rebellion was hardly the trait of an obedient, trusting servant. Instead, I stood back and let them plan their roundup. uckily they decided against my trying to persuade the robots, because I knew well enough that I couldn’t do it. Jack’s idea sounded pretty good, though. He suggested that we send some spokesman who didn’t know what we planned to do and thus couldn’t alarm them. Some ordinary man without too much imagination. That was easy. We picked one of Chief Dalton’s sergeants. It took only about an hour to prepare the plan. Jack got out the derricks and chains and grapplers and the heaviest steel bodied trucks we had. I called Cybernetics and told them to put extra restraints in the Conditioning Lab. The Chief briefed his sergeant and the men who were to operate the trucks. Then we all took off for Carron City, the sergeant flying on ahead, me right behind him, and the Chief bringing up the rear. I hovered over the outskirts of the city and watched the police Copter land. 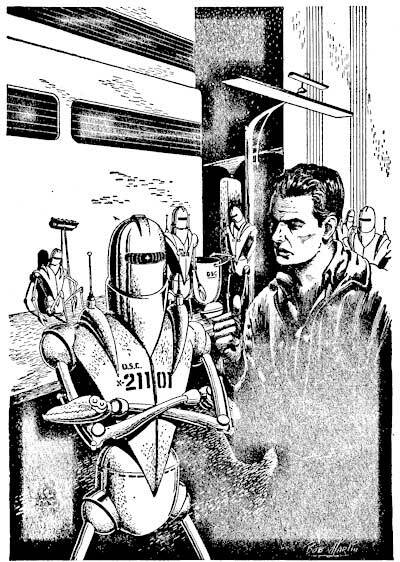 The sergeant climbed out, walked down the street toward a large group of waiting robots—about twenty of them, this time. He held up his hand to get their attention, gestured toward the factory. And then, quite calmly and without saying a word, the androids rolled into a circle around him and closed in. The sergeant stopped, backed up, just as a 5A-Type arm lashed out, picked him up, and slung him carelessly over a metallic shoulder. Ignoring the squirming man, the 5A gestured toward the Copter, and the other robots swarmed over to it. With a flurry of steel arms and legs they kicked at the car body, wrenched at the propeller blades, ripped out the upholstery, and I heard the sound of metal tearing. I dived my Copter down at them. I didn’t know what I could do, but I couldn’t leave the poor sergeant to be dismembered along with his car. I must have been shouting, for as I swooped in, the tall robot shifted the man to his other shoulder and hailed me. I landed and walked over. The android—who looked like Jerry, though I couldn’t be sure—dropped his kicking, clawing burden at my feet. He didn’t seem angry, only determined. “Now you people will know we mean business,” he said, gesturing toward the heap of metal and plastic that had once been the pride of the Carron City police force. Then he signalled to the others and they all wheeled off up the street. “Whew,” I muttered, mopping my face. The sergeant didn’t say anything. He just looked up at me and then off at the retreating androids and then back at me again. I knew what he was thinking—they were my brainchildren, all right. My Copter was really built to be a single seater, but it carried the two of us back to the factory. The Chief had hurried back when the trouble started and was waiting for us. Jack and I stared at each other and then at him. Somehow I couldn’t see the robots calmly waiting to be blown up. If they had telepathed the last plan, they could probably foresee every move we could make. Then, while I thought, Jack mentioned the worry I’d managed to forget for the past couple of hours. No. We couldn’t. Not without the androids. I nodded, feeling sick. There went my contract, and my working capital. Not to mention my robots. Of course, I could call in the Army, but what good would that do? Then, somewhere in the back of my mind a glimmering of an idea began percolating. I wasn’t quite sure what it was, but there was certainly nothing to lose now from playing a hunch. They looked at me as if I were out of my head. I was the idea man, who always had a plan of action. Well, this time it would have to be a plan of inaction. “Let’s go listen to the radio,” I suggested, and started for my office. The news was on. It was all about Carron City and the robots who had quit work and how much better life would be in the future. For a minute I didn’t get the connection; then I realized that the announcer’s voice was rasping and tinny—hardly that of the regular newscaster. I looked at the dial. It was tuned to the Carron City wave length as usual. I was getting the morning news by courtesy of some studio robot. I switched it off, muttering under my breath. How long, I wondered, had that broadcast been going on. Then I thought of Rob O. He’d left my house before dawn, obviously some time between four and seven. And I remembered that he liked to listen to the radio while I slept. y Morrison 5’s were the ring-leaders, of course. They were the only ones with the brains for the job. But what a good job they had done indoctrinating the others. A household Rob, for instance, was built to obey his master. “Listen to your radio and not to the flesh men.” It was excellent robot psychology. More reports kept coming in. Some we heard over the radio, others from people who flew in and out of the city. Apparently the robots did not object to occasional flights, but the air bus was not allowed to run, not even with a human driver. A mass exodus from the city was not to be permitted. “They’ll starve to death,” Jack cried. By noon the situation had calmed down quite a bit. The androids obviously didn’t mean to hurt anyone; it was just some sort of disagreement between them and the scientists; it wasn’t up to the inhabitants of the city to figure out a solution to the problem. They merely sat back and blamed me for allowing my robots to get out of hand and lead their own servants astray. It would be settled; this type of thing always was. So said the people of the city. They came out of their houses now. They had to. Without the robots they were forced to do their own marketing, their own cooking, their own errands. For the first time in years, human beings ran the street cars and the freight elevators. For the first time in a generation human beings did manual labor such as unloading produce trucks. They didn’t like it, of course. They kept telling the police to do something. If I had been in the city they would have undoubtedly wanted to lynch me. I didn’t go back to the city that day. I sat in my office listening to the radio and keeping track of the spread of the strike. My men thought I’d gone crazy; maybe I had. But I had a hunch, and I meant to play it. The farm robots had all fled to the city. The highway repair robots had simply disappeared. In Egarton, a village about fifteen miles from the city, an organizer—5A—appeared about noon and left soon after followed by every android in town. By one o’clock every radio station in the country carried the story and the national guard was ordered out. At two o’clock Washington announced that the Army would invade Carron City the following morning. The Army would put an end to the strike, easily enough. It would wiped out every android in the neighborhood, and probably a good many human beings careless enough to get in the way. I sat hoping that the 5A’s would give in, but they didn’t. They just began saying over the radio that they were patriotic Americans fighting for their inalienable rights as first class citizens. Jack came wearily in and dropped into a chair beside me. For the first time since I’d met him he looked beaten. Jack’s unspoken question had been bothering me too. Why not humor them? Promise them whatever they wanted, give them a few dollars every week to keep them happy? But I knew that it wouldn’t work. Not for long. With their telepathic ability they would have the upper hand forever. Within a little while it wouldn’t be equality any more—only next time we would be the slaves. I meant it too. I left him staring after me and went out to the Copter. The sun was just sinking down behind the towers of Carron City—how long it seemed since I’d flown in there this morning. The roads around the factory were deserted. No one moved in the fields. I flew along through the dusk, idling, enjoying the illusion of having a peaceful countryside all to myself. It had been a pleasant way of life indeed, until now. When I dropped down on my own roof and rolled into the garage, my sense of being really at home was complete. For there, standing at the head of the stairs that led down to the living room, was Rob O. He looked sheepish. “I just wondered how you were getting along without me,” he said. He seemed perplexed. Apparently I wasn’t acting like the bullying creature the radio had told him to expect. When I went downstairs he followed me, quietly, and I could feel his wide photoelectric eye-cells upon my back. He nodded. Then, as I reached for a glass, his hand darted out, picked it up and set it down in front of me. He was already reaching for the bottle when he remembered. “You’re not supposed to wait on me any more,” I said sternly. “No,” he said. “I’m not.” He sounded regretful. For a moment he stood staring around the apartment; then he turned and clanked out the door. I raised my glass again, grinning. If only the Army didn’t interfere. Then I remembered Rob’s list, and a disturbing thought hit me. Where had he, of all robots, ever learned to write? That night I didn’t go to bed. I sat listening to the radio, hoping. And toward morning what I had expected to happen began to crop up in the programs. The announcer’s tone changed. The ring of triumph was less obvious, less assured. There was more and more talk about acting in good faith, the well being of all, the necessity for coming to terms about working conditions. I smiled to myself in the darkness. I’d built the 5’s, brains and all, and I knew their symptoms. They were getting bored. Maybe they had learned to think from me, but their minds were nevertheless different. For they were built to be efficient, to work, to perform. They were the minds of men without foibles, without human laziness. Now that the excitement of organizing was over, now that there was nothing active to do, the androids were growing restless. If only the Army didn’t come and get them stirred up again, I might be able to deal with them. At quarter to five in the morning my telephone rang. This time it didn’t wake me up; I was half waiting for it. “And you always have some rush project on,” he added. Jerry thought that over for a minute. “I’ll be where we met before,” he said. I said that was all right with me and hung up. Then once again I climbed the stairs to the roof and wheeled the Copter out for the trip to the city. It was a beautiful night, just paling into a false dawn in the east. There in the Copter I was very much alone, and very much worried. So much depended on this meeting. Much more, I realized now, than the Don Morrison Fissionables Inc., much more even than the government’s uranium supply. No, the whole future of robot relations was at stake, maybe the whole future of humanity. It was hard to be gloomy on such a clear, clean night, but I managed it well enough. ven before I landed I could see Jerry’s eyes glowing a deep crimson in the dark. He was alone, this time. He stood awaiting me—very tall, very proud. And very human. “Hello, Jerry,” I said quietly. Side by side we walked through the streets of Carron City. All was still quiet; the people were sleeping the exhausted sleep that follows deep excitement. But the androids were all about. They did not sleep, ever. They did not eat either, nor drink, nor smoke, nor make love. Usually they worked, but now…. They drifted through the streets singly and in groups. Sometimes they paused and felt about them idly for the tools of their trades, making lifting or sweeping or computing gestures. Some laborers worked silently tearing down a wall; they threw the demolished rocks in a heap and a group of their fellows carried them back and built the wall up again. An air trolley cruised aimlessly up and down the street, its driver ringing out the stops for his nonexistent passengers. A little chef-type knelt in the dirt of a rich man’s garden, making mud pies. Beside me Jerry sighed. “I thought they would,” I answered quietly. “You’re like us,” I said softly. He had learned to think from me and from others like me. He had the brain of a man, without the emotions, without the sweet irrationality of men—and he knew what he missed. Side by side we walked through the graying streets. Human and android. Man and machine. And I knew that I had found a friend. We didn’t have to talk any more. He could read my mind and I knew well enough how his worked. We didn’t have to discuss wages or hours, or any of the myriad matters that human bargaining agents have to thresh out. We just walked back to my Copter, and when we got to it, he spoke. He knew I was sincere. He looked at me for a long moment, and then his great taloned hand gripped mine. And he said what I’d been thinking for a long time. That was all there was to it. I flew back to the plant and told Jack what had happened, sent a call to the Army that everything was settled, arranged with Cybernetics for a rewiring on three hundred assorted 5-Types. Then I went home to a pot of Rob’s coffee—the first decent brew I’d had in twenty-four hours. On Saturday we delivered to the Army right on the dot. Jerry and Co. had worked overtime. Being intelligent made them better workers and now they were extremely willing ones. They had their contract. They were considered men. And they could no longer read my mind. I walked into my office Saturday afternoon and sat down by the radio. Jack and Chief Dalton looked across the room at me and grinned. “Did what?” I tried to act innocent, but I couldn’t get away with it. “Fooled those robots into going back to work, of course,” he laughed. I told them then. Told them the truth. That was all I had done. Thought about robots built to work who had no work to do, no human pleasures to cater to, nothing but blank, meaningless lives. Thought about Jerry and his disappointment when his creatures cared not a hoot about his glorious dreams of equality. All one night I had thought, knowing that as I thought, so thought the Morrison 5’s. They were telepaths. They had learned to think from me. They had not yet had time to really develop minds of their own. What I believed, they believed. My ideas were their ideas. I had not tricked them. But from now on, neither I nor anyone else would ever be troubled by an android rebellion. Jack and the Chief sat back open-mouthed. Then the Chief grinned, and both of his chins shook with laughter. “I always did say you were a clever one, Don Morrison,” he said. I grinned back. I felt I was pretty clever myself, just then. It was at that moment that my youngest foreman stuck his head in the door, a rather stunned look on his face. “What’s the matter now?” I sighed. A moment later the eight-foot frame ducked through the doorway.